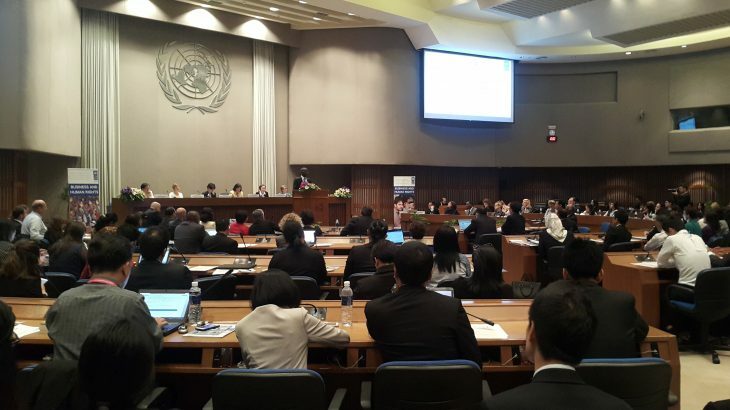 Bangkok, 1-2 June 2017 – The Human Rights Resource Centre took part in the Regional Workshop on Business and Human Rights: Moving Ahead with National Action Plans, which gathered 200 key representatives from states, businesses, civil society, and trade unions at the United Nations Conference Centre in Bangkok, Thailand, to discuss how decision-makers from all sectors, in particular governments, can work hand-in-hand to mainstream human rights practices in business operations, and drive momentum for an ASEAN Community that protects not only profits, but also people and the planet. “We now have to make the Guiding Principles a reality,” exhorted Dr. Michael Addo, Chair of the UN Working Group on Business and Human Rights, in his Keynote Address. In doing this, there is a need for a common understanding of the Guiding Principles amongst leaders and to raise awareness amongst the various stakeholders. In addition, he said leaders need to be credible in putting forward the Guiding Principles in activities, downstream to stakeholders in affected communities and upstream within partnership communities, including governments and businesses. The two-day event featured insightful panel discussions on the following topics: (1) Update on global progress and challenges in implementing the UNGPs; (2) Update on ASEAN progress and challenges in implementing the UNGPs; (3) The State Duty to Protect: Opportunities and challenges in developing National Action Plans – the ASEAN Experience; (4) The Corporate Responsibility to Respect: Challenges and opportunities in implementing the UNGPs – The ASEAN experience; (5) Access to effective remedies: Exploring gaps and solutions; and (6) Exploring effective responses: Dialogue with civil society organisations, indigenous people groups and trade unions. At the penultimate session of the workshop, the participants deliberated on the proposed Regional Strategy on CSR and Human Rights, which was drafted following the ASEAN Intergovernmental Commission on Human Rights (AICHR) Seminar on Promoting Corporate Social Responsibility (CSR) and Human Rights in ASEAN held in Singapore on 3-4 November 2016. A second draft of the document will be produced as part of the outcomes of the event. The Regional Workshop was jointly convened by the ASEAN CSR Network, the Ministry of Justice Thailand, AICHR Thailand, UNDP, and the United Nations Economic and Social Commission for Asia and the Pacific “as part of the continuous effort to elevate the importance of the business and human rights cause in the region,” according to Ms. Yanti Triwadiantini, Chair of the ASEAN CSR Network. AICHR, All, ASEAN, Business & Human Rights, News, Thailand AICHR, Business and human rights, National Action Plan. permalink.